A lot of Mac users take the Dock for granted. They click on it to launch programs, dump files in its Trash can, and never give it a second thought. But you can customize the Dock’s appearance as well as its contents. Here are a handful of tips that will give you total control. The best thing about the Dock is that whenever you need to open an application, drag a file on an icon, or move something to the Trash, it’s ready to serve you. But do you really need to see it all the time? 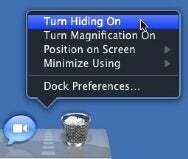 You can hide the Dock by Control-clicking on the separator (the dashed line), displaying the contextual menu, and choosing Turn Hiding On. When you do this, you’ll see the Dock slip away toward the edge of your screen. When you want to see it, or drag an item to it, just move your cursor to that edge, and the Dock will slide back out. You’ll save in screen real estate, and the many icons won’t distract you. When you Control-click on the Dock’s divider, a number of options display in the contextual menu. While you’re at it, think about whether the bottom of the screen is the best location for your Dock. Why not free up some of your vertical space by putting the Dock to one side of the screen instead? Click on the separator to access the contextual menu, choose Position On Screen, and then choose Right or Left. I use the left side myself, because the Dock gets in the way on the right side when I go to click on scroll bars of windows that touch the right side of the screen. Here’s how the Dock looks with a simplified 2D look at the bottom of the screen. This adds a space among the applications section of the Dock. You can drag this space around (even though it looks like there’s nothing to grab) to put it where you want. Run the command again and you’ll get a second spacer. If you ever want to remove your spacers, just click on them and drag them off the Dock. In this screen shot, two applications—Terminal and Safari—are hidden. Since I've run a special Terminal command, their icons appear translucent. When you do this, hidden applications will display in the Dock with translucent icons. You can still click them and drag them as you do normally, but you’ll be able to spot, at a glance, which programs you’ve hidden.